A MAN described as “Mr Mt Martha” passed away on Tuesday 6 November. 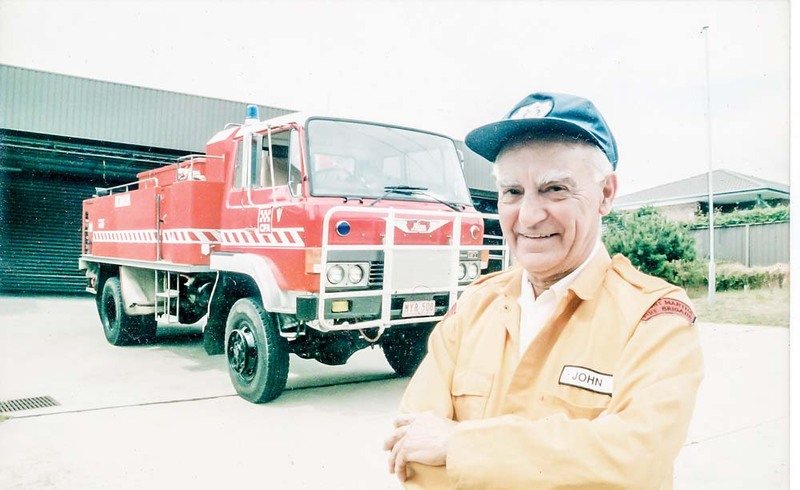 John Pingiaro, 95, played a big role in the growth of the district as a founding member of Mt Martha Fire Brigade in 1951 and as an early member of the Mornington Yacht Club in 1946. He was a Life Member of Mt Martha Fire Brigade, Life Member of the CFA, received a 70 years’ service award in 2013 and a Queens Fire Brigade Long Service and Good Conduct medal, in 1974. In February this year, as a spritely 94-year-old, Mr Pingiaro took part in the Gold Coast Commonwealth Games Torch Relay along High Street, Frankston. Long-time friend and colleague at the Mt Martha brigade Bruce Conboy, who is to read the eulogy at the funeral, said Mr Pingiaro and his wife Margaret, who died in May, had adopted Mt Martha as their home and did much to help it develop into a peaceful community with good facilities. “John was very community minded,” Mr Conboy said. “He was a fountain of knowledge on Mt Martha, especially on things around World War II. Born in 1923, Mr Pingiaro and his family followed their father Domenici from Italy to Melbourne in 1932, moving soon after to a house in Dunns Road on the opposite side of Balcombe Creek to The Briars. He attended the single-teacher Osborne Primary and then Caulfield Technical School where he obtained his Merit Certificate. During the war he was an apprentice fitter-and-turner at a pump making business in Springvale and then joined the Balcombe Army Camp’s apprentice school as an instructor. He joined the Mornington Bushfire Brigade and was also a member of the Volunteer Defence Corps and Victorian Coastal Battery covering Port Phillip Bay. Mr Pingiaro and his brother Frank took The Ghan to Alice Springs and then Darwin to help in the town’s rebuilding program after the war and drove trucks back to Melbourne in 1947. The pair established Mt Martha Motors in Lochiel Avenue as well as a taxi service, volunteer ambulance and hire car business to service the Army camp. In 1955 Mr Pingiaro joined the Education Department and taught at various schools, including Dromana Technical School for 14 years. “John was very proud of his teaching, especially when former students became master tradesmen,” Mr Conboy said. He and Margaret married in 1961 and they had children Anthony, Brendan, Raymond and Elizabeth. Brendan is a member of Mt Martha Fire Brigade. Mr Pingiaro also served on the Mt Martha Citizens League, Mt Martha Community Association, and Mt Martha Foreshore Committee. In 1970 he was made a trustee of the Mt Martha Pre-School in Watson Road and treasurer of Mt Martha Scouts. Margaret was also a driving force in community life, and involved with St Vincent De Paul, Mornington Combined Churches, and Mt Martha Pre-School. “She provided John with financial sheets and reports for most of his meetings,” Mr Conboy said. A joint funeral service for Mr and Mrs Pingiaro will be held at St Macartans Catholic Church, Drake Street, on Thursday 22 November. The cortage will proceed to the Craigie Road cemetery where Mt Martha firefighters will hold a ritual burial service, each saying a prayer and dropping a sprig of rosemary onto the coffin. The couple’s coffins will be placed in the same grave.